This week’s blog post was written by Teacher Advocate Risa Fadenrecht. Earlier this summer I confessed to you my long history of bibliophilia and brought you a list of diverse titles for your summer reading pleasure. This month, I’m back with new media recommendations; this time: movies! And because we are educators, I’m sticking with a theme: films with teachable moments. Friendly reminder: Before showing films in class, make sure to check on your school’s policy on showing movies to students. Some of these films contain difficult or mature elements so please be sure to preview on your own before showing them in class. All selections will lend themselves to excerpts as well as full-length viewing. These recommendations are not intended to represent or endorse any particular view, but are intended to facilitate rich discussions...or just plain personal enjoyment! This film is one of several documentaries on my list this summer, and I want to give a special shout-out to our illustrator and resident film buff, Kate Moore, for putting this one on my radar. Three Identical Strangers is the true story of how identical triplets were intentionally separated at birth, unbeknownst to their parents, as part of an experiment. The film is a can’t-miss opportunity for discussions on nature versus nurture and medical ethics. I might just host my own movie night/discussion group! What factors should we consider when deciding if a medical or scientific practice is ethical? If the doctor had received permission from the parents to separate the triplets, would that have made the separation ethical? Why or why not? Who doesn’t love a Pixar movie? And a sequel to an old faithful at that! The Incredibles 2 kicks off with a storyline in which traditional gender roles are reversed as super-mom, Elastigirl, is recruited for an (illegal) super mission while her super-husband takes on domestic duties in her absence. 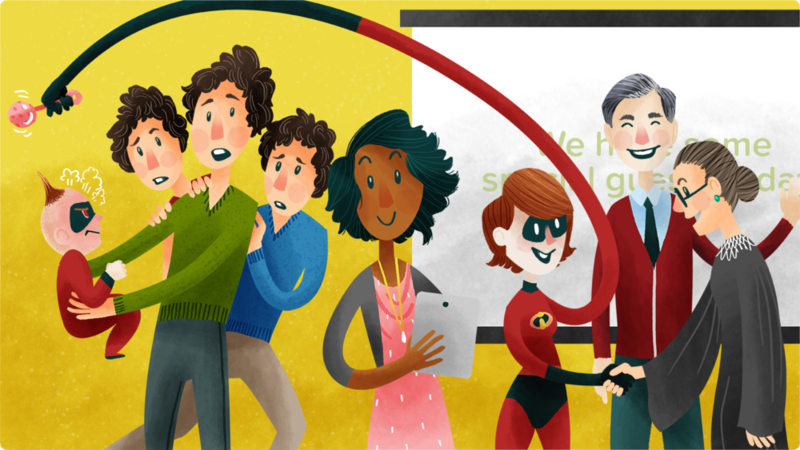 As with many children’s films, The Incredibles 2 provides a simple platform to discuss narrative arc and character archetype, in addition to a potential discussion around diverse family dynamics. Who are some other heroes who had to break the rules to help others? Think of real and fictional examples. Do you think it’s acceptable to break the rules in order to help someone? Give examples and defend your answer. Think about how chores and responsibilities are divvied up in your family. Do you help? Does everyone help? Who does which chores? When you have your own home, how would you want to share responsibilities with family members? While her pop culture appeal may not resonate with everyone’s political sentiments, this documentary on Supreme Court Justice Ruth Bader Ginsburg offers relevant insights into our country’s recent history of gender disparities in professional, political and personal realms. And even if RBG herself is not your cup of tea, the film provides myriad entry points for discussion. Where to start? The challenge of bias in biography? A debate on any number of Ginsburg’s famous court cases? The relationship between politics and pop culture? I’ll try to not overwhelm you with the possibilities. Have students identify elements of bias in the film. Facilitate a discussion about their observations and the implications of the biases they identify. This can happen aloud or with a Pear Deck. Have students create pieces of pop culture-style iconography (memes, t-shirts, bumper stickers, etc) based on a political icon (past or present) of their choice. Students can vote on the most creative submissions. Give examples of bias you observed in the film. How did bias add to or detract from the quality of the documentary? Did it affect the way you personally felt about RBG? What are some specific ways the filmmaker could have made the film more neutral? Is it the responsibility of filmmakers (specifically documentary makers) and biographers to remain neutral in their storytelling? Why or why not? Which one of Justice Ginsburg’s cases interested you most? Why did it catch your attention? I shamelessly saved my favorite recommendation for last. For many teachers, this documentary about Mr. Rogers will be a feel-good walk down memory lane, while few (if any) students will have experienced his television show in the way that so many of us did. The film is a beautiful study in social-emotional learning. Mr. Rogers valued children’s feelings as equal to those of adults, and bravely tackled difficult and controversial topics with the utmost respect. Organize students in pairs or small groups. Have them create their own puppet characters and write a script for a story that teaches a lesson on empathy or other social emotional topics. Students might use digital media options such as illustration and voiceover or stop-motion animation to convey their stories as well. What is empathy? What does it look like to show empathy? What does it feel like to receive empathy? Share an example of a time where someone showed empathy to you, or where you saw someone showing empathy to another person. Think of some of the example episodes from the film. Which topics did Mr. Rogers teach about that are still relevant now? If Mr. Rogers was still alive and making new episodes, what kind of topics do you think he would cover?